If you are an environmental conscious and an organic food lover, this is the place to be. Hipo Organic Food uses organic ingredients including the the oil in which they deep fry the falafel and eggplants for the sabbich. This place mainly serves sabbich, falafel and hummus, and you c an add different salads, vegetables and sauces at the buffet style stand (try the spicy parsley). The organic part makes the food much tastier, especially the hummus. 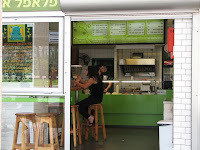 If you go there we recommend to take the sabbich which is awesome and one of the better ones in Tel Aviv. It's on the corner of Iben Gvirol and Zaitlin, next to Rabin Square.